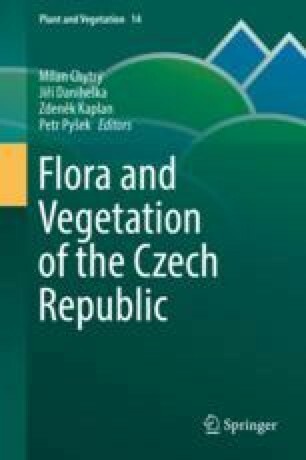 A long-term perspective is a crucial dimension for understanding the present-day composition and structure of the Czech flora and vegetation. We outline processes that were important for the development of the present-day diversity of flora and vegetation including extinctions of taxa and ecological mechanisms operating within glacial-interglacial cycles. Further, we present the history of vegetation during the key stages in the glacial and postglacial periods. First, we outline the pattern in the vegetation during the last glacial, including a discussion of the existence of refugia for trees. We further describe the changes in vegetation during the Late Glacial, which were mostly the results of abrupt climatic events. We also present a new synthesis of the Holocene regional development in vegetation based on a Landscape Reconstruction Algorithm, which results in different regional vegetation trajectories and three main phases in the development of vegetation. Finally, we give some examples of the histories of local vegetation at several sites mainly based on plant macrofossils. We thank all the contributors to the Czech Quaternary Pollen Database, which made this synthesis possible, Jiří Sádlo for fruitful ideas for this study, Milan Chytrý, Anna Potůčková and Pavla Žáčková for providing photos, Milan Chytrý for valuable comments on an earlier version of the manuscript and Tony Dixon for language editing. We also thank the Czech Science Foundation for financial support (projects no. 16-06915S and 16-10100S).